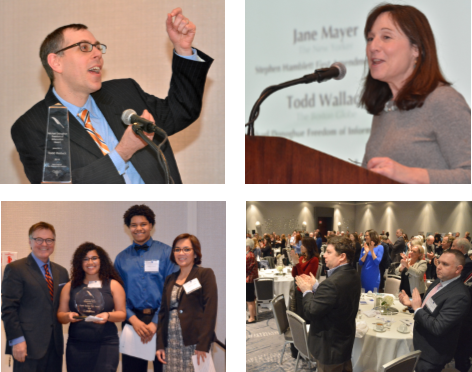 The winners and the audience at the New England First Amendment Coalition’s awards luncheon Friday, Feb. 23, are shown above, clockwise from top left: Todd Wallack, an investigative reporter with The Boston Globe’s Spotlight Team, who received the Michael Donoghue Freedom of Information Award; Jane Mayer, a writer for The New Yorker, whowon the Stephen Hamblett First Amendment Award; the audience applauds an award recipient; members of the Hyde Square Task Force, who were presented the Antonia Orfield Citizenship Award: from left, Ed Harding, an anchor at NewsCenter 5, WCVB-TV in Boston, who emceed the awards ceremony, with task force members Mabel Gondres, Shayne Clinton and Celinda Miranda. The awards ceremony took place during the New England Newspaper and Press Association winter convention, which ended Saturday, Feb. 24, in the Renaissance Boston Waterfront Hotel in South Boston. Please check the Bulletin website in the days ahead for more coverage of the convention.